The new Dura Step anti-fatigue mat combines technology and craftsmanship in an exclusive 2-layer construction. A durable embossed wear surface of vinyl is polymerically integrated with a moisture resistant, closed cell vinyl sponge base. 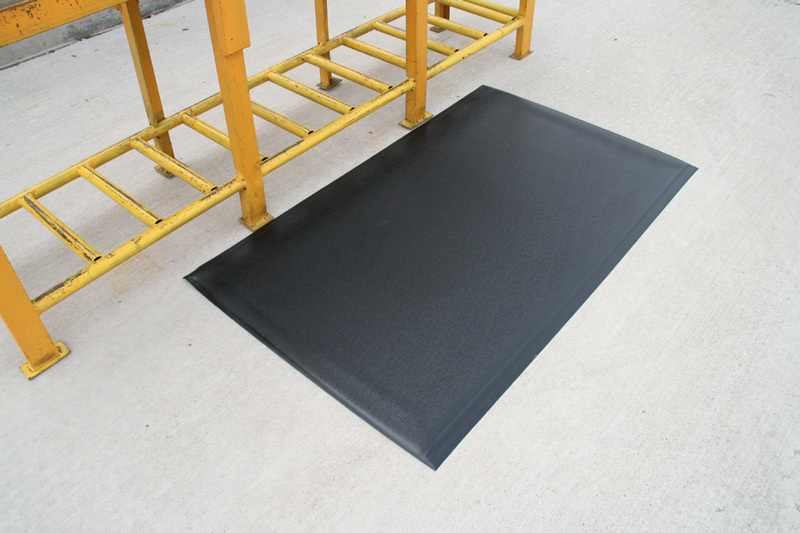 The advanced dual action performance of this double layer standing mat provides safety, comfort and a long duty cycle in a matting product that is superior to standard single-layered foam mats. This exclusive manufacturing technique combines a 3/32” embossed wear surface with a 3/8” closed-cell soft sponge base layer, creating an overall thickness of approx. 1/2". Durable beveled edges on all four sides provide users with a lay-flat safety border insuring smooth surface to surface transition. Enjoy maximum comfort and durability with this incredible 2 layer construction anti-fatigue matting!